The traffic problem in Karachi has gone from bad to worse to the absolute worst in a reasonably small expanse of time. No amount of signal-free corridors, bridges, underpasses and new roads have been able to alleviate what is one of the biggest causes of suffering for the city’s populace. While the recent grand encroachment operation under the Supreme Court’s instructions turned out to be a beacon of light for the citizens, things once again went astray when this too resulted in no significant improvement for the people of Karachi. However, no matter how hard the government tries, it won’t be able to curb the growing traffic issue that results in the loss of millions of hours of productivity, blockage of economic activity and even causes environmental degradation, unless it focuses on the root problem behind the issue – the unchecked number of bikes on Karachi’s roads. In a city already plagued by a disproportionate number of bikes, where the bike to car ratio is ultimately too high in favour of the former, the makers of this single track vehicle continue to set new records for sales. According to reports, Atlas Honda Limited (AHL), a leading bike manufacturer, sold a total of 187,249 bikes in 2017-18 against 136,476 units in 2016-17, and followed by other manufacturers, a cumulative of around 1.6 million units were sold. This doesn’t stop here. Since prices have dropped significantly across the country, as many as 7,500 new bikes hit Pakistani streets with each passing day, adding to Karachi’s traffic woes and making traffic management that much harder for the traffic police. This massive influx of bikes wouldn’t have been a problem of great concern if only it was regulated. But a lack of planning on the authorities’ part, accompanied by the fact that bike owners seldom follow any rules – parking as they please, blocking spaces meant for cars, speeding and violating road safety rules – have turned bikes into a menace. Consequently, traffic jams in most busy parts of the city have become a part of our daily routine, and the traffic gains achieved through infrastructure during Mustafa Kamal’s tenure are long gone. Add to it the lack of investment in sustainable public transport by the government and the gradual decline of available resources, and a city faced with an aggravated transport crisis emerges. 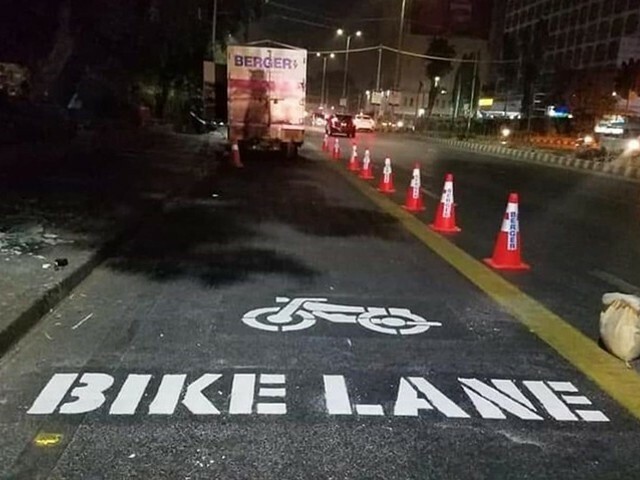 Perhaps finally taking note of the growing bike problem and the acute stress put forth by this on the city’s roads, the government introduced a 20-kilometre long bike lane dedicated for bikers on Shahrae Faisal, Karachi’s main artery, and this lane stretches up to Karsaz Road. Wearing helmets has also been made mandatory, accompanied by an awareness campaign to ensure greater road safety measures. As this is a first of its kind project initiated alongside a main road, it was anticipated to be the harbinger of change for the city’s unfettered traffic patterns, with plans to adopt similar measures in other parts of the city too. Unfortunately, none of the anticipated change has materialised and the project seems to be a failure as of now. Despite a ‘traffic enforcement unit’ reportedly being made from within the traffic police to ensure motorcyclists travelled in their lanes, every time I went through the road I didn’t find a single biker travelling in the designated lane, and there appeared to be no supervisory body monitoring this either. Motorcyclists in Karachi are either oblivious to the separate yellow bike lane, or all but refuse to travel upon it. After all, bikers are not known for following traffic rules, and therefore it is quite naïve to expect them to automatically start following the separate lane. This is precisely where the traffic police would come in, where they would not only identify violators but also penalise them with fines. Obviously, that didn’t happen either, but it does make one wonder how bikers are to be fined if most of the thousands are not following the law to begin with. Did the Sindh government really think it could change Karachi’s decades-old bike culture, where there is no concept of lanes and trespassing between lanes is the norm, just like that? The failure to implement the rules in this regard speaks volumes regarding the government’s lack of interest in solving the traffic problem and letting it turn into a mammoth that will only be harder to deal with in the future. Concrete steps need to be taken by the local government to solve the traffic problem and for that, public transport needs to be a priority. Karachi has never needed more buses and green line projects as it does now. New alternatives to public transport, such as the circular railway or even a subway sometime in the future, can help ease the burden on our roads and the increased reliance on bikes can be reduced too. However, if things remain the same, I am afraid Karachi’s trade and business activities will continue to be severely impacted as our traffic issue only worsens and more people take longer to get to their workplaces, causing irreparable damage to the economic hub of the country. Strange that you observed only bikers not considering yellow line , did you notice that all the bus, cars, rickshaws, trucks are using that track and you expect bikers to keep on following those lazy bus drivers ?